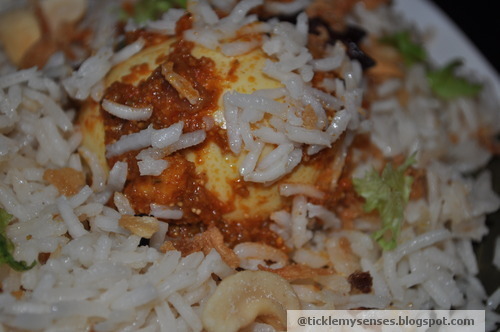 This Hot and Spicy Egg Dum Biriyani is another one of my creations in times of need. 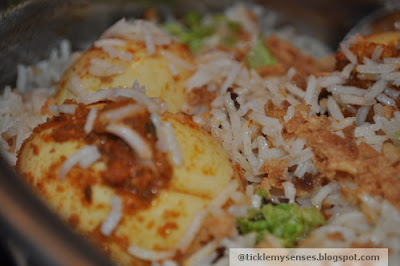 I must say it is tasty, flavoursome and surely satisfying. Definitely worth savouring. This year our fennel plant produced a lot of fennel seeds/ sweet cumin/ saunf. 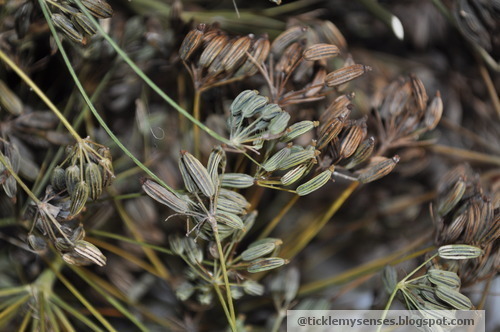 Dried fennel seed is an aromatic and fruity, anise/ licorice-flavoured spice, which is brown or green in colour. When fresh these seeds are leafy green in colour and are tender to the bite and so sweet, makes a delightful after-meal digestive and mouth freshener. It is an essential ingredient of the well known Indian spice mixture panch phoron and the chinese five spice powder. 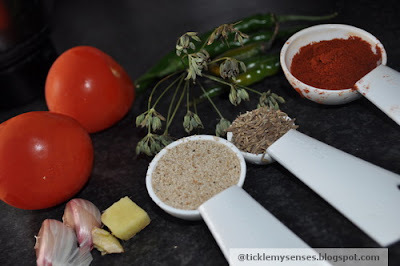 I just cannot resist adding these tiny aromatic seeds to my pulao's or meat curries as it adds a lovely taste to the dish. If you are interested in learning more about the benefits of fennel seeds click here. 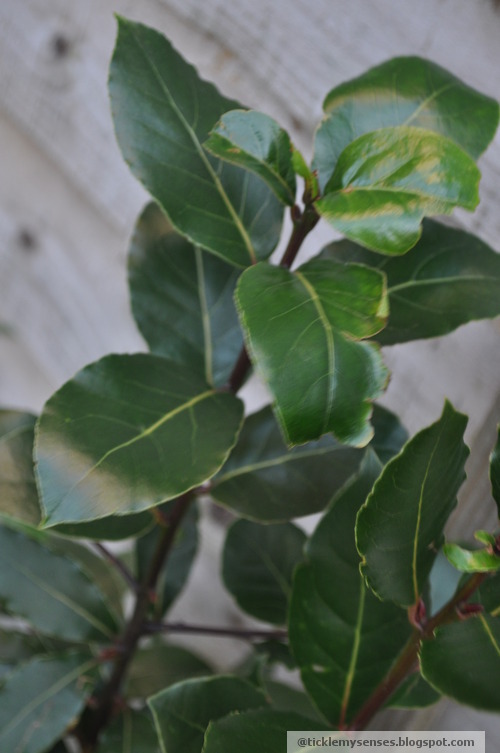 Our bayleaf plant has done well too, producing large sweet smelling leaves, useful for uplifting the flavour of any biriyani. Couldnt resist using them for this recipe. 1. 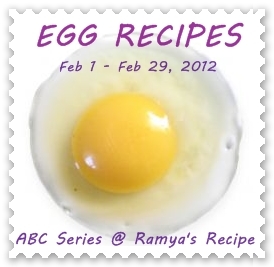 Boil the eggs in a wide, deep pan filled with enough water to cover them and bring the water to a boil. Boil for 10-12 minutes. 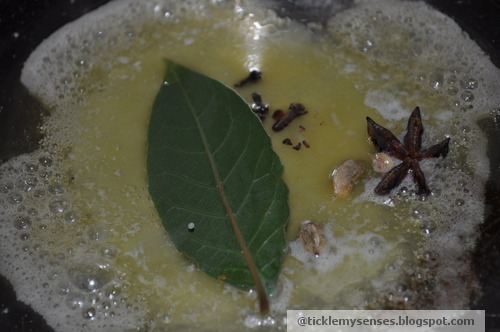 Turn off the flame, transfer to cold water & peel off the shells. 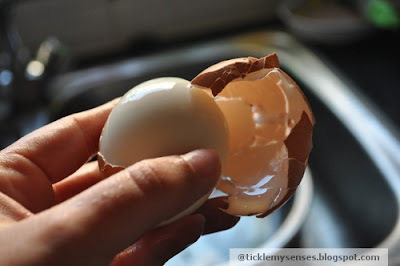 Slit the surface of the eggs vertically. Keep aside. 2. 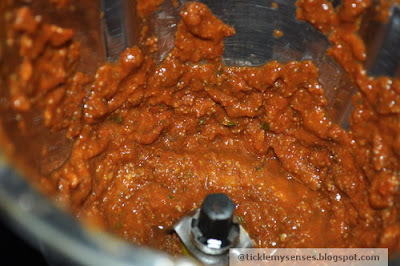 Grind all the masala ingredients to a fine paste, without adding any water. 3. 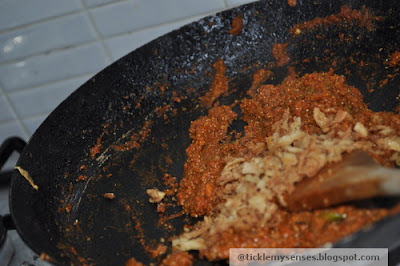 Take 2 tbsp of oil/ ghee in a non stick pan, add the ground masala, fry on medium heat for 5-6 mins, stirring well till the masala comes together or leaves side of pan. 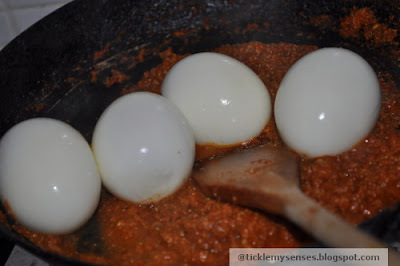 Add a handful of browned onions, the boiled eggs, 2-3 tbsps of water to make a thick gravy which coats the eggs. Let the gravy come to a boil for 2 minutes. Turn off the flame. 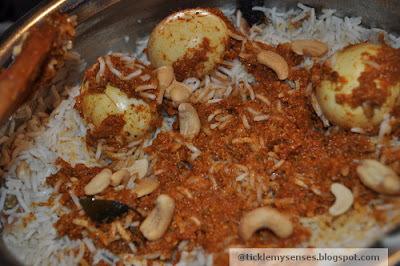 then add the drained rice. Fry for a couple of minutes till the rice slightly changes colour, then carefully add 41/2 cups of hot water to the rice. Add salt to taste, and the lime juice . Allow the rice to come to a boil on a high flame uncovered, then turn down heat to medium, cover the vessel with a glass lid and let rice cook till water is seen bubbling through holes in rice. Then turn the heat off and allow the rice to cook undisturbed in its own heat for 7-10 minutes. 5 . 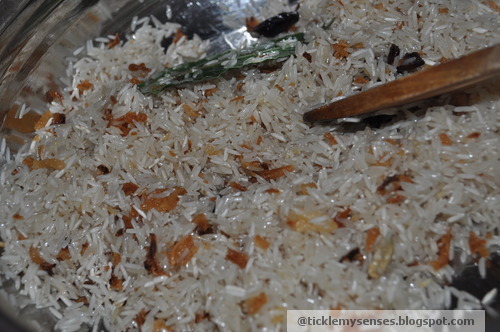 Once the rice has rested , carefully run a fork through the rice to seperate the grains. 6 . Preheat oven for dum to 180C or 375 farenheit. 7. 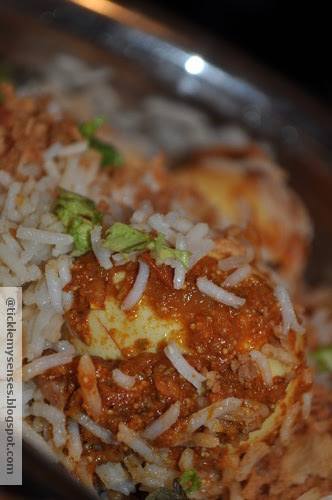 Grease the vessel to be used for dum, place half of the rice at the bottom, top it with all of the eggs and masala evenly, sprinkle half of the browned onions, coriander and mint leaves, place the remaining rice on the top. 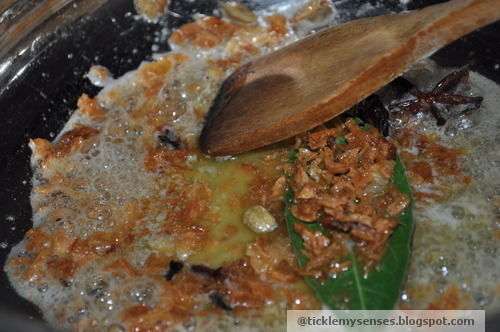 Sprinkle the remaining browned onions , mint and coriander leaves, garam masala powder, cashewnuts and rose water. Cover the top of the vessel with a layer of foil, place the lid. 8. Place the biriyani vessel in center of a preheated oven at 180C for 20 minutes or on a old tawa, over a low flame for 15-20 minutes. 9 . 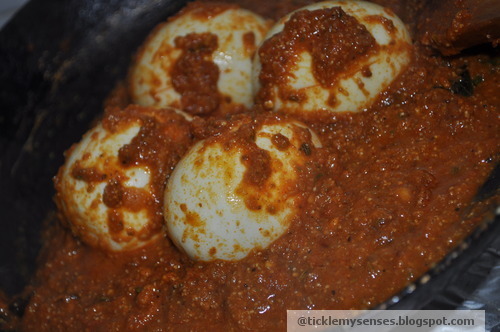 Serve hot with raitha. 1. I tend to keep a packet of shop bought ready fried onions in an airtight container. Comes in very handy for recipes like this, and for making biriyani's and pulao's. Available in Asian stores in the UK. If you cannot find them, then next time you brown onions for any dish make a larger quantity and store in a clean airtight container, will save you a lot of time especially for quick/ express cooking. I tried this today Carol. Looks very good, came out very well. Now you get fried onions in Tesco too, if you can not find in the Asian ones.